Thread: What kind of Poison? 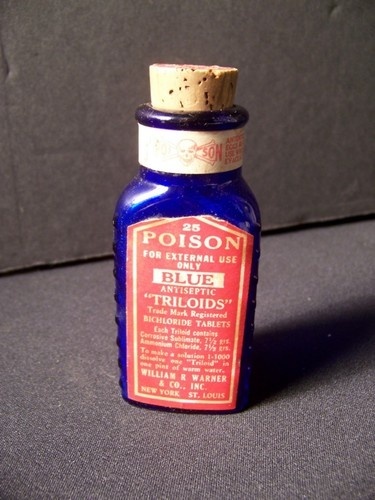 So a friend brought me this beautiful cobalt blue bottle labeled "POISON" that has these triangle tablets in it. Google search lead me to this forum. I'm hoping someone can tell me something about 1) the bottle and 2) what is in it. Thank you for replying. So basically the predecessor to the modern isopropyl alcohol wipes, would that be comparable? :-) Although I am not a collector of bottles, I am a collector of interesting antique chemistry. Is there a good reference resource I could explore to determine the age, company, etc, of this particular tablet? The bottom of the bottle has an X M 6 in a vertical row. Would that be enough to identify further information about it? Oh, as embarrassing as this is, I was so engrossed by the bottle & tablets I completely missed the cork stopper, which had the company name clearly printed on it. LOL. Wm R Warner & Co. Unfortunately the markings on the bottom of this one don't mean anything to anyone other than the factory workers. As for age, I'm guessing that it dates to around the 1900s or 1910s. Hard to say exactly.